My mom always thought she would become a nun. She spent her youth and young adult life in a convent preparing to do just that. Although my brothers and I owe our lives to the fact that didn’t work out (thanks to my handsome and charming Dad), the piety she possessed then, has never waned. When I was a little girl, she taught me songs she learned as a young postulant. Softly and still as night comes stealing. It is the end of day. All of my childhood through my teenage years (and all the drama that went with it) up until I left home to get married, she never failed to tuck me in with songs and prayer. So, I can’t begin this post without giving a misty-eyed nod to mom. She gave me such a beautiful example of how to make life a seamless song of praise. Not that I can compare, and I fall short daily. But I’m grateful for her illuminating the corners of my heart with the first light of faith. So, as I begin a new chapter of life as a stay-home mom, I’ve been joyfully anticipating being able to integrate faith like my mom did. Although I only have one full week under my belt of being home in the morning, many of these things I’ve done for years either on weekends or on my own. Here are a few of the ways we’ve been trying to sneak in a few sacred seconds with the Savior. My son Gabriel shared with me once, that every morning when he wakes he makes the sign of the cross. He marks himself with the Father, the Son and the Holy Spirit. A physical way to brand his soul and mind with the reminder that he is a Christian. Also a gesture of thanksgiving in waking up to greet another day. my sins by casting them into the furnace of Its Merciful Love. day be united together in Heaven for all Eternity. Amen. The moment I am consciously awake, I try to whisper a quick “Good Morning Jesus, thank you for this day. Help me spend my time, serving you today.” So often, I go to bed frustrated with myself that I wasted time, lost my patience or somehow “blew it” in various ways. So, I added the last part of the prayer to remind myself that I need God’s help every day and in all things, like time management and self-discipline. The older kids no longer do this but it’s something I still cherish with Karolina and Gus. As I carry them downstairs in their cozy pj’s and bed-head hair, we go over to the crucifix and statue of Mary for morning kisses. We love “Good Morning Jesus” by Dana. I would definitely recommend this one for the little ones! 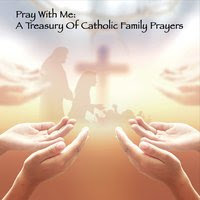 The entire album is good, and also a great way to learn prayers like the Angelus. Even on a busy morning, we always listen to a bit of Good Morning Jesus during breakfast. Another recommendation is “St. Patrick’s Breastplate” by Christ Music Kids. The prayer of St. Patrick himself is a powerful way to start the day. Set to music, it’s a catchy reminder that God is with us, always. (all of these mentioned are available on iTunes). and Evangelizo, we always have the liturgical readings handy. Magnificat is also a wonderful resource (great reflections that go with Sacred Scripture, as well as daily mass, etc). This is such a vital component to begin the day. Even on rushed days where other things may be omitted, the gospel reading is a must. 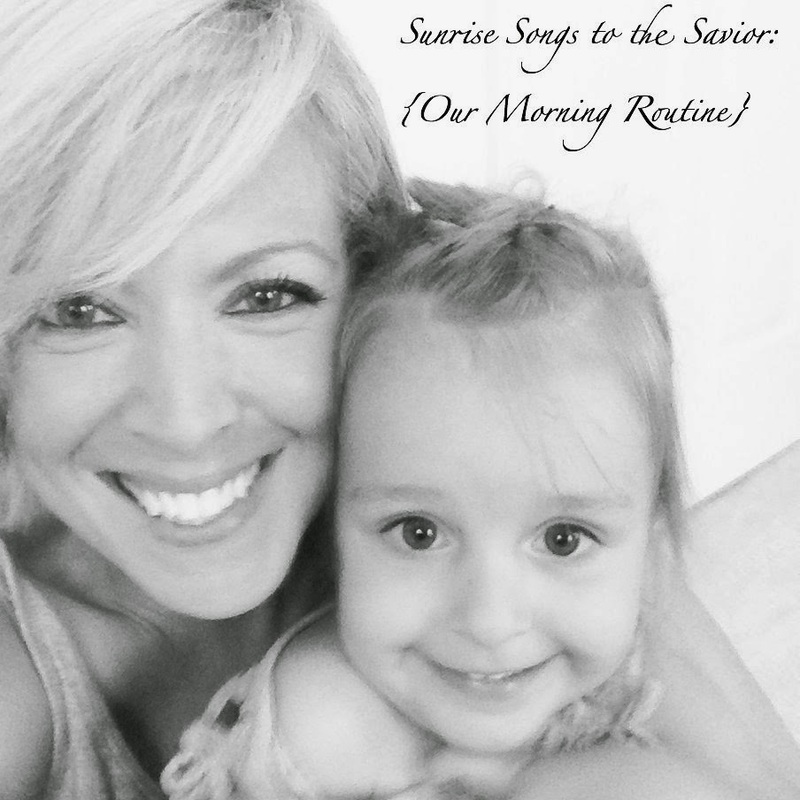 A morning rotation of prayers is a tradition that was started a few years ago by my husband. It used to be in the minivan on the way to school. Now. it’s a quick football huddle before breaking into bus stop formation. It’s often brief, but just a quick moment to gather and one person leads the prayer and offers their intentions for that day. water. It’s not a superstitious thing, it really is a powerful sacramental tool. After that, it’s pretty much on to our day of getting dressed, eating, diaper changes, cleaning up and repeat! If it seems like I’ve listed a lot in our routine, remember most of these are literally under 2 minutes. Just little bits to help capture the holy miracle of another new day. Have a wonderful morning, friends!